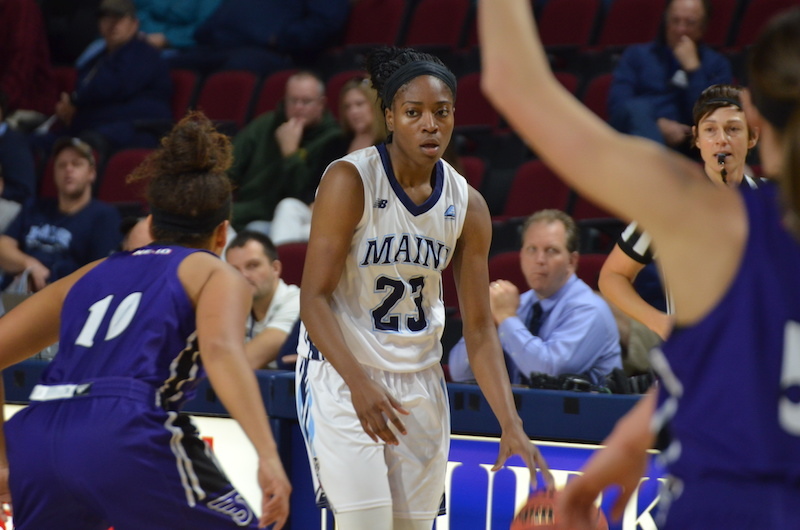 The University of Maine Women’s basketball program (14-8) traveled to the Tsongas Center in Lowell, Massachusetts to take on the University of Massachusetts-Lowell River Hawks (3-19). An unorthodox 11:00 a.m. start time for a Wednesday’s game didn’t slow down the Black Bears as they cruised past the River hawks 69-51 for their fifth straight win. UMaine is now 7-2 in conference play. The Black Bears lit it up from behind the arc led by second-year guard Blanca Millan who finished with 22 points, 18 of those in the first half. The Black Bears’ shooting, especially from 3-pointers, was key in their victory over the River Hawks. Millan and first-year guard Saar Dor got things going early in the first quarter each hitting a 3 in the opening minutes to give Maine a 6-0 advantage before Brianna Rudolph hit a 3 for UMass-Lowell to settle things down. The Black Bears took a 17-10 lead into the second. Maine scored 22 in the second quarter to break open the game but UMass-Lowell kept it close early with a 6-0 run to tie it up. Back-to-back Maine turnovers gave the River Hawks two easy layups by third-year forward Oda Shackelford and first-year guard Katie Mckie. These easy buckets forced Maine to take a 30-second timeout out the gate. Coming out of the timeout a missed 3 by second-year forward Fanny Wadling led to another chance for the River Hawks who capitalized in the paint with a bucket by Paula Lopez to tie the game at 17-17. Millan, who has done it all year for the Black Bears, responded to the 6-0 run with a 3 to give Maine a 20-17 lead, and the team wouldn’t look back. They would trade a few shots after the 3, but Maine would break open the game with a 12-0 run to close out the half. The run started at 3:14 on a Wadling lay up and she followed it up by making a sweet mid range jumper. During the run Millan also hit back to back 3-pointers. Maine would finish the half up 39-26 on 7-11 shooting from behind the arc (63.6 percent) and 16-31 from the field (51.6 percent). The Black Bears continued their offensive rhythm in the second half. Third-year guard Parise Rossignol would come out of the locker room with the hot hand. After only scoring two first half points, Rossignol would score on back to back buckets each assisted by Julie Brosseau to extend the Maine lead to 17. The closest the Hawks would make the game is 10 points the rest of the way as Maine had a day on the offensive end, the Black Bears scored just 14 of their 69 from inside the paint and scored 18 points off turnovers. Millan, Dor and Rossignol all finished with double-digit points and Brosseau finished with 9. Dor led the team with six assists on the day and Brosseau finished with four. As a team the Black Bears shot 55 percent from behind the arc, 43.1 percent from the field and hit 80 percent of their free throws in an impressive offensive showing. The Maine women looked to continue their winning ways and win a sixth straight game, Saturday afternoon in Vestal, New York against the Binghamton University Bearcats. They did just that, and in an impressive fashion, after suffering a tough OT loss at the Cross Insurance Center on Jan. 6 with a final of 66-62. Saturday afternoon the Black Bears would avenge the loss in a big way Saturday afternoon, trouncing Binghamton 61-38. Led by Millan, redshirt third-year Tanesha Sutton and Brosseau, who all scored in double-digits, Maine’s win over the Bearcats was never in question. The first half was all Maine, with Sutton leading the way by scoring 11 of her 15 in the first half to pace the Black Bears. The Black Bears would break it open in the first quarter after burying three shots from behind the arc, two of them back-to-back by Rossignol, that would give them a 17-5 advantage. Brosseau would help Maine finish the first quarter on a high note, hitting a big 3 with 4 seconds left to extend the lead to 20-7. Maine would never look back after that. Maine’s shooting was impressive in the first half, from 3 the Black Bears were 62 percent (5-8) and 52 percent (13-24) from the field. The Black Bears also played suffocating defense, capping the half with four blocks and four steals, holding Binghamton to a dismal 29 percent (8-27) from the field in the first half. Maine would finish the half up 14 on Binghamton 34-20. The second half wasn’t as friendly to the Black Bears as they shot 1-6 from three, the lone shot hit by Brosseau, and shot 40 percent from the field overall. They still managed to get the job done and not give up the lead at any point during the game. The defense, who forced four steals in the first half, forced six more in the second half for an impressive final total of 10 steals on the game. Millan, who finished with 20 points and two blocks, had five of the steals, proving she can do it on both ends of the floor. The Black Bears defense contained and controlled the pace forcing Binghamton to take difficult shots. Clearly, Binghamton was uncomfortable and couldn’t find an offensive rhythm. The Bearcats would finish the game shooting an ugly 25 percent from the field and 31 percent from behind the arc as the Black Bears dominated.